I gots a job!! From the 14th I will be selling soap and candles at the German Market eeeevery single day, all day, until the 22th of December. It's going to be long hard days, but the you're reading the blog of a Director now... I know... respect, eh? I want to say that again. Director. Director. Director! Yeah, I took it too far. But it's probably the only time in my life I'll be able to call myself that, so Imma take advantage! Director. How cool is this garlic soap? My point is, I won't be too active on this blog - I simply won't have time for anything but work. I will have about 12 hours long workdays, and then there's about 1-2 hours travel, and then I have to try to fit in making breakfast, lunches, dinners, having showers, brushing teeth, not oversleep.. But this is a miracle for us. We've been in a real crunch, and this will put a proper bandaid on our debt, not to mention we could be able to get Jian's sister and mom some ok gifts for their coming birthdays. But that's it - for Christmas everyone's getting soap. Have you started thinking about Christmas yet? It's all I think about in November! Just because you're cold in the winter, doesn't mean you can't be fashionable with something other than scarves, does it? 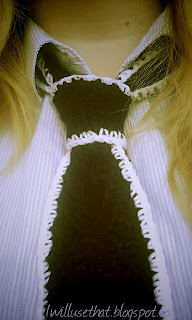 Why not make a tie? It's cute, it's warm, and it's an easy evening-project! Halloween is coming up, and personally I can't wait to dig into some really bad, old classics. Freddy, IT, Nightmare Before Christmas (NOT to be counted as a bad one, their songs simply make me happy!). I searched the net for some fun Halloween tutorials. I tried to gather something budget-friendly, and I found some really great ones! I love any excuse for special and fun decor, but unfortunately I can't afford to this year.